Several years ago, Tanna came up anemic in a routine blood test done by my vet. At the time, I was feeding a hodge-podge of vitamins, so I went looking for a single good multivitamin. On the recommendation of another rider, I looked at HorseGuard's Mega-Dose. I am a numbers girl and I have an extensive spreadsheet set up to evaluate my horses' entire ration for nutrients. 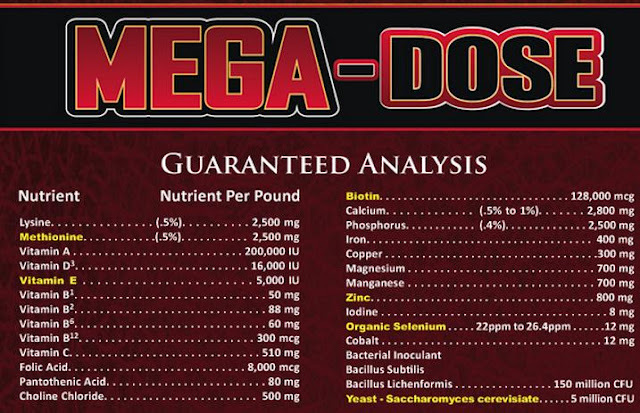 I plugged the numbers in for Mega-Dose and was pleased with the overall addition to the rations and was able to replace several supplements I had been feeding. 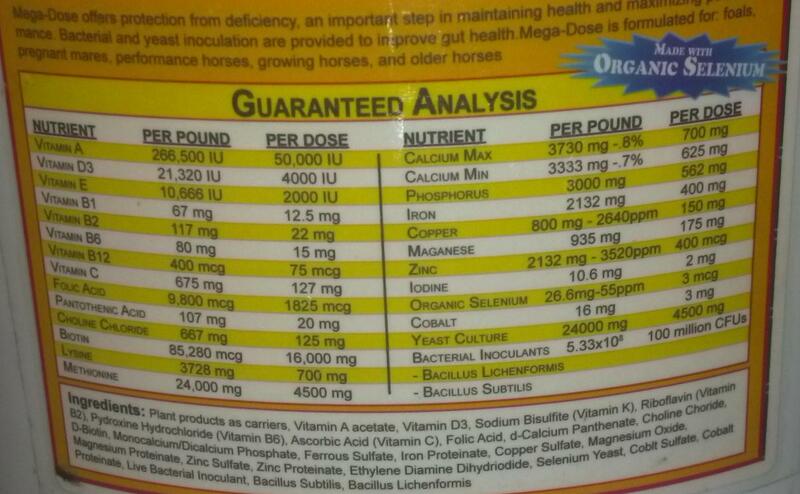 In February 2006, I began to feed the horses 3 oz of Mega-Dose a day. On a recheck several months after feeding Mega-Dose, Tanna was no longer anemic. Count me happy. I continued to feed Mega-Dose for years. And continued yearly blood work on all my horses to keep an eye on any anemia problems that might pop up. In March 2012, Tanna again came up anemic. I was concerned, but gave him Red Cell for a month and a recheck showed him ok. I couldn't just add Red Cell to his ration, though. Red Cell has massive amounts of Vitamin A, as does Mega-Dose. Even his feed (Nutreena XTN and Omolene 100) has some Vitamin A in it. I finally got around to re-evaluating the rations and to my absolute surprise, Mega-Dose changed formulations somewhere along the way, decreasing the amount per pound of many vitamins and increasing the dosage from 1.5 oz per 500 pounds of animal to a flat 4 oz recommendation. And the Guaranteed Analysis from a bucket from 2006 or 2007. To further belabor the point, I've put the "Per Pound" numbers side by side in the following table to show the changes to the formula. Only 2 values increased. One was Biotin to a nice 128 mg per pound instead of 85.28 mg per pound. The other was the addition of Magnesium. Every other number dropped some or even significantly. I am very annoyed at myself for not catching this sooner and I honestly don't know when the formula changed. I guess the lesson for me is to re-evaluate the ration every so often to be sure something hasn't changed. As a result of this discovery, I have decided to discontinue use of Horse Guard's Mega-Dose and go with a different option. I'd love to hear what your favorite multi-vitamin is as I research new options for my horses. I start training endurance horse soon and wa sthinking to give D&H Vitamins and Minerals (http://www.dodsonandhorrell.com/our-feeds/herbs-supplements/daily/daily-vitamins-minerals.html). Extra Biotin and C-Vitamin is needed probably. At the moment with no work I like the most D&H Equi-Bites (http://www.dodsonandhorrell.com/our-feeds/herbs-supplements/daily/equi-bites.html). Interesting posts you have! Thanks! Sanna, thanks for the recommendation. I'll look those up and see what I think! We have a variety of horses at the barn I work at and we like to feed EquiPride. It seems to be a pretty good all around supplement. just catching up but interesting post. I have used the Horse Guard Vitamins for years, but their original version with the selenium I love the stuff and have always had horses do very well on it. Never needed the megadose but good info you shared. How did you go about discovering your horse was aneamic? Jonna, I'm glad the Horse Guard original is working for you. I found out Tanna was anemic during a routine blood test by my vet. The first time, he suggested it since Tanna is a performance horse. After Tanna came up anemic the first time, I've just made the blood work a routine part of their spring vet visit. All 3 horses get blood work every spring now. The test isn't very expensive (about the cost of a couple of shots), but can reveal issues that I can't see with my eyes. And we have baselines so we can see if anything is subtly changing over the years.